The landscapes with windmills, a topic inherited from Dutch painting of the previous centuries, are a permanent feature in his oeuvre. Already a work of 1840 depicted a windmill near Overschie, in a vertical composition quite close to the one analysed here. This subject depicted in a vertical composition is rare in his work, as Jongkind preferred the horizontal "landscape" format. 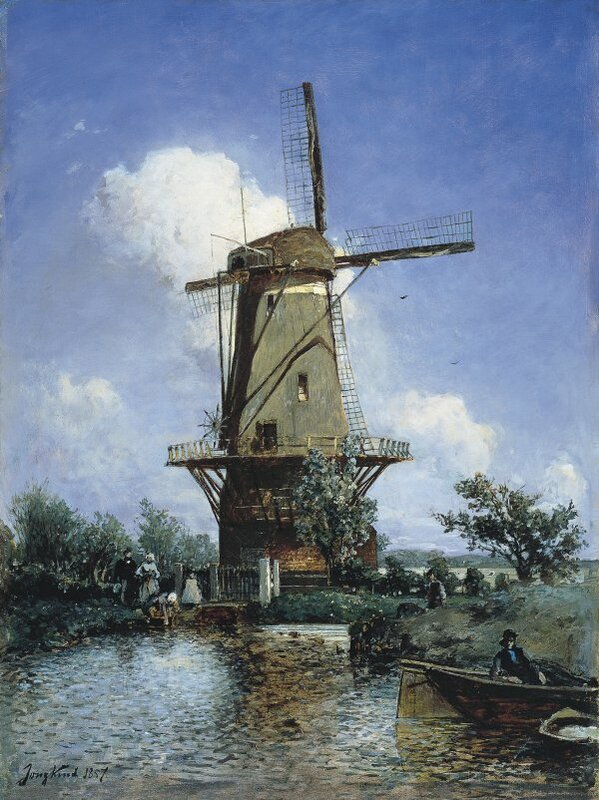 On 11 May 1857 he wrote to Martin that he had begun another painting with "a windmill in a vertical composition by daylight, which I have just sketched from nature." On 15 May, in another letter to Martin, he specified that his painting represented "a windmill painted on a vertical canvas and sketched from nature near Rotterdam." Jongkind mentioned another painting representing windmills in a letter to Martin dated 11 June. These letters inform us of the fact that this subject was often present in the mind of the artist and that there may have been a demand on the part of French collectors for this particular theme. Jonkind's work style remained the same throughout the years. Watercolours painted from nature served as models for the paintings which the artist developed according to his own mood. The same study could give rise to identical paintings or to noticeably different works. It is also known that Jongkind applied a certain level of fantasy to his interpretations and that his works were not always faithful to the model. During his years in Holland, his chosen contact in Paris remained Firmin Martin, who bought many of his works at a low price and sold them very quickly with a small profit. Jongkind sold him his paintings for 100 to 200 FF apiece, and sent them to Martin via the Dutch-Belgian rail service. He received his money by return of post. The transactions seemed to have taken no more than 5 or 6 days. 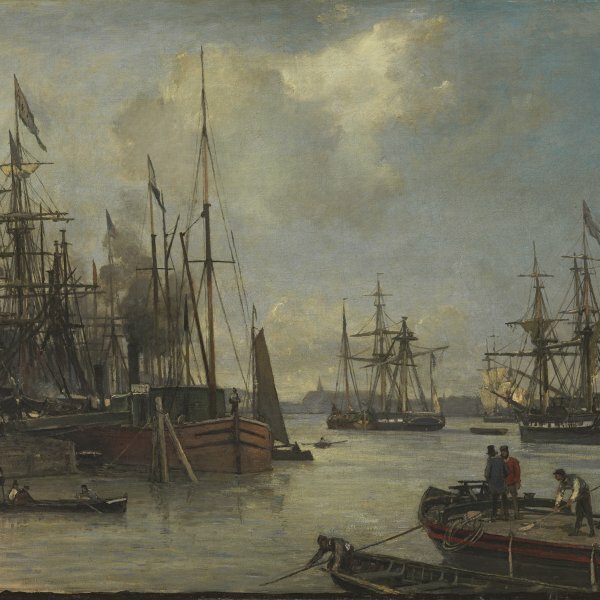 On the occasion of the sale organised in March 1856, after his departure for Holland, Jongkind's paintings were sold for 50 to 180 FF, and in September 1856 Beugniet bought a painting for 150 FF. Martin seemed therefore to offer Jongkind a fair price, rapidly providing the money the artist needed for his everyday expenses. This painting from 1857 shows high quality and a balanced composition. The centre of the painting is taken by the outline of the windmill, whose mass is attenuated by the lightness of the sails and of the railing. The verticality of the windmill is softened by the shape of the clouds in the background, which cross the composition diagonally and add fluidity to the whole. The water shimmers in the foreground, depicted with small juxtaposed brushstrokes, strongly "impressionist" before its time. To the left and to the right of the windmill, the groups of trees and the figures echo each other and liven up this scene of everyday life in Holland. The gleaming water in the foreground recalls an area at the back of the trees and the man in the boat, on the right-hand side of the picture. The light reflected in that zone opens up a more distant horizon and leads the beholder away. The subject of the Dutch windmills also seduced for a period Eugène Boudin, Charles Daubigny and Claude Monet, during their sojourns in that country. Jongkind was certainly involved with this.